Atmega 128 is like other AVR microcontrollers. They are ISP – is in-system programmable. Earlier I wrote an article about AVR ISP programmer where 74HC244 buffer is used. Using buffer is safer for your AVR. 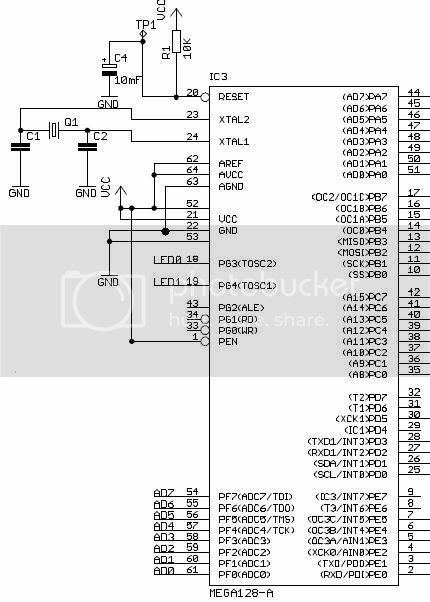 But what if you need 128 atmega programmer without any parts, then you can connect your microcontroller directly to LPT port or use protection resistors (220R) just in case. of course circuit works without resistors, but you put your LPT port at risk. Integrated Processor RISC AVR rules! I had try the programmer but cannt work? Can i use that for atmega8 ? yes you can. it works wit all AVR microcontrollers that support ISP programming interface. btw…the distance between the programmer and the avr is about 20cm of ordinary wire.. (with a breadboard in the middle of the way…) can it interfere? For Atmega128 The MOSI/MISO pins are PE0 and PE1 for data in SPI Programming mode. Look in Atmega128 datasheet page 304.
yes…i said that on the first msg(pins E1 and E0)…. i double checked it again, and It keeps unworking.. what can it be?… I shorted the crystal connection… (the 10mhz crystal was 20cm away from the chip).. can it be an “isp-unprogramable” chip? or is the chip damaged anyhow? btw…can the avr get damaged by a static discharge? I have always handled it by hand…i noticed that when i hold the device on reset, some IO pins remain high….that isn’t normal, is it? Can i use that for atmega32 ? Of course you can. It is same ISP programmer for all AVR microcontrolles. i get â€œdevice missing or unknown device(-24)â€ with exactly the same circuit as above and the powerlines. i now stuck at writing program part. i tested the probe and it is fine. then i try is it can detect my chip, then i click read device, and it can run. LPT pins 20 : 25 should be connected to ground. I’ll test that. want to ask ur favour..can u give me the spi connection circuit of atmega 16 using ps2 joystick? hi guys.. i’ve also tired this technique.. but not working. Ponyprog says error (-24) device not found. anyupdate?? what have i done wrong?? idea ? i’m using ATMEGA32L PLZ PLZ PLZ help.. i need it very badly. Thank you for the note to use PE0, PE1 I was using MISO and MOSI, your reply save my time.. every thing is OK now . i am using atmega32, all the settings are done according to the figure,probe gives test ok, when i try to write it gives “device missing or unknown device(-24)” then ignoring it gives something else, it writes 100%, verifies 100% then it gives writing failed.what am i doing wrong ? does it really work ? any help is appreciated….thanx. bit d7 dosn’t work in my pc i excute som prog. in it why is so it? Hello i made the device and i think that works ok because no errors from ponyprog but when i try to read flash and eeprom from the already programmed device i only get this: \FF FF FF FF\ exept if i read the calibration byte that returns 0x99. and getting the same programming problem. I had the same problem – error “device missing or unknown device(-24)”. May sound incredible, but in my case what helped, was to replug the lpt connector. i have the -24 error as many other people do but it seems that nobody care, there a many requests for the same issue and no single answer. It used to work in the past with other (older) computers.I have tried winXP32, Win7-32. Hello all, can this programmer supports to program the IC AT89S51 or AT89Sxx…? I wonder can this simplest ever design be used on AT89c5131A -UL ?? Guis, it works! But AVR chip needs to be powered up. I powered up Attiny 26 from the computr’s supply, and it works well! Tested! The resistors in my case are 330 Ohms for more LPT security.